Winter Coats, My Picks from Online and the High Street. Jackets and blazers are my outerwear options of choice during the early part of Autumn, but when Autumn turns to Winter, something more substantial is needed. From the palest rose to vibrant cerise, the Winter of 2013 was dominated by the pink coat. This trend has continued with a wide selection of pink coats for 2014. The Autumn Winter 2014 catwalks saw a wider variety of colours featuring outerwear in a plethora of shapes, styles and textures. Alexander McQueen and Stella McCartney showed chunky realistic looking faux furs in rich dark colours. DKNY’s were monochrome stripes and Mickael Kors presented a camoflauge pattern both of which could only have graced an animal from a fairy tale. They had the shape in common though, mid-length and straight. The choice both online and on the high street is seemingly endless. John Lewis has a brilliant selection. A Duffle coat is essential for the preppy look and is complimented perfectly by brogues and the ever popular leather satchel. The mid-length is a stylish yet practical option. This season, Burberry Brit’s are bright. In contrast, Vanessa Bruno’s are winter white. A down jacket is perhaps the warmest option. From country walks to watching at the touchline, a puffa will hit the spot. Burberry and Sacai offer high fashion options but those from outdoor brands Barbour, Canada Goose and The North Face are as stylish as they are practical. A parka is defined as a waterproof coat, usually with a faux fur lined hood. A lighter weight option than a puffa. For effortless chic, throw over a cocktail dress for the Christmas party. Sport-luxe queen Stella McCartney has added kudos and cool to the humble anorak with her designer parkas. The biggest trend for Winter 2014 seemed to be shearling. (We’re no strangers to sheep here in the Yorkshire Dales). Design houses Gucci and Bottega Veneta made their coats entirely of it. Miu Miu and Marni used shearling as a trim on elegant, long wool coats, epitomising feminine winter style. 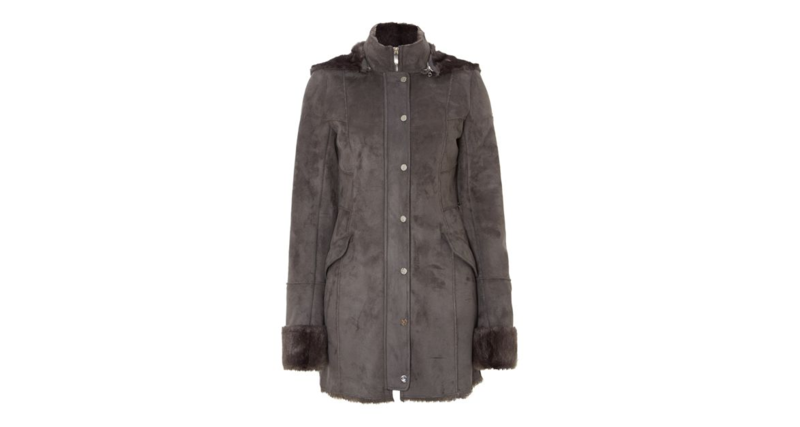 Until 3rd November, there is up to £75 off coats and Boots at Hobbs. Oh, thank you. I'm so glad it's been useful. There were so many to choose from! I have my eye on several! I am very lucky to be gifted items, but my reviews of them are honest and true and I don't accept anything that I wouldn't choose myself or that doesn't fit with my style or the style of my blog. I feel privileged to work with brands, especially the smaller ones and I've met a lot of excellent business women behind these brands. I particularly enjoy working with smaller brands. Many are the brainchild of working mothers like myself. They don't have the budget for advertising campaigns but are able to send samples to selected bloggers. For me, it's a lovely reward for what is essentially a labour of love. For them, it gets their brand out there. In several cases, we have become friends and continue to support each other in a saturated market.